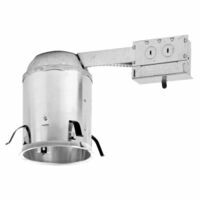 Air-tite fixture sealed and gasketed to prevent airflow between attic and living areas. For installations where housing will be in direct contact with ceiling insulation. Integral thermal protector guards against misuse of insulation materials and improper lamping. 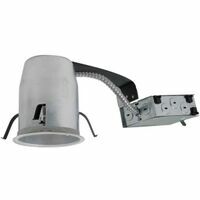 Adjustable socket bracket assures proper and consistent lamp positing. Junction box is listed for through branch circuit wiring and has seven 1/2" knockouts. Slide-N-Slide connectors allow non-metallic sheathed cable to be installed without removing knockouts. Pre-installed captive bar hangers allow housing to be positioned at any point within a 24" joist span. Can be field shortened for 12" joist. Installation: 7-1/2" height allows use in 2 x 8 joist construction. Housing accommodates ceilings up to 1" thick. Requires 6-1/2" ceiling opening. Listings: UL Damp Locations. UL Feed Through. UL Listed for direct contact with insulation. CSA Certified. IP Rated.